This time, the Kindred have gone too far. A Blood Hunt rages and the Garou are its targets. The Black Spiral Dancers have seized the Fanum, and they threaten the gods themselves. But the Garou are fighting back. Armies are mustered and legions march. What vampire can survive the wrath of the Garou? And Not Going To Take It! 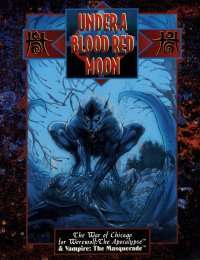 A Werewolf/Vampire crossover, this supplement presents a multifaceted storv playable by Garou, Camarilla or Sabbat characters. Garou can avenge themselves on Chicago, Camarilla Kindred can fight back to save their necks during the assault, or Sabbat can attempt to use the counfusion to take over the city. Details on the Garou caerns in and around Chicago. Hints on running the story for other player character types, such as witch-hunters or mummies. Rules for that most loathsome of creatures: the Abomination, a werewolf who has been Embraced into the world of the Damned. This title was added to our catalog on February 01, 2006.